I've been gone more than I've been home the last couple of weeks. The AQS Quilt Show in Paducah, Kentucky, is always fun. I usually go on our guild's bus trip. While I love looking at the quilts and vendors at the show, I think my favorite part of the trip is walking around town to see all of the sites and other quilters out and about town. My roommate Elizabeth and I walked 3 miles or more each day we were there. 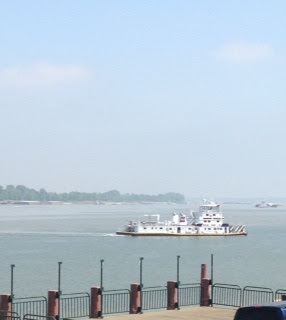 On the day our group went to the quilt show, she and I walked down to the Ohio River to watch the boats and relax by the river. The flood walls are decorated with beautiful artwork. Here is a close up of one of the sections. It looks like you could walk right down that street. The best part of the quilt show is the people that you meet. When we stopped at Hancocks of Paducah on Friday night to shop, I looked up and straight in front of me was Kevin from Kevin the Quilter blog. Of course, I yelled his name. I am a big fan of his blog, and I'd have known him anywhere. I love seeing his quilts, reading about his family, and seeing his new home. We had some time to chat a bit before my bus left and the store closed. I'm glad Kevin thought to take our photo that night. Here are a couple of photos from Hancocks. I think with our 2 buses, there were around 100 people, and the parking lot was packed with cars so there were lots of shoppers in there. We walked over to the Hexie House on Friday -home of Paper Pieces. This gorgeous Millefiori quilt hung on the wall there. This wall hanging had lots and lots of tiny pieces. This quilt looks like an antique, but I'm not sure it was. I think it is a replica of an antique using 30s fabrics. Love that hexie layout. What am I saying? I love anything with hexagons. This one is hanging by the check out counter. It is from the Jaynette Huff book Quilts from Grandmother's Garden. That is a good hexie book to have on your shelf. I'm really drawn to those hexagons! Here I am with Karen Styles I love her quilts. She was here from Australia. Check out her patterns at this link. Of course we were in the Paper Pieces booth. 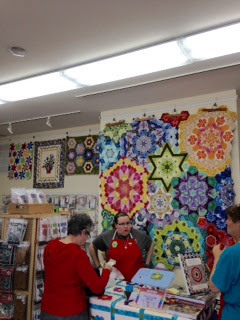 This oval hexagon quilt was hanging over the counter. Here is John Flynn demonstrating his rail system for machine quilting. I stop and look at every show, and one of these days I'm going to buy one. If you don't want to walk around Paducah, there are all different modes of transportation. Here is one of several horse drawn carriages. We didn't see Eleanor Burns, but here is a photo taken in her Quilt in a Day shop. This is a photo from the Finkel Building. Way in the back is the Primitive Gatherings booth. If you've never been to Paducah during the quilt show, there is a lot there to see and do. There are also lots of goodies to buy. I'll show you some of that and some of the quilts in my next post. I spent last week in Shipshewana, Indiana, at our semi annual Jane Stickle Retreat. The weather was beautiful all week. I was able to get up close and personal with some of the horse and buggies. Their fabrics are just gorgeous. Here are just some of the black and white and red fabrics. Here's a wide shot of Yoders Department Store. Yes. There's lots more fabric here. Rebecca's Arts and Antique Shop on Morton Street. I was there twice. 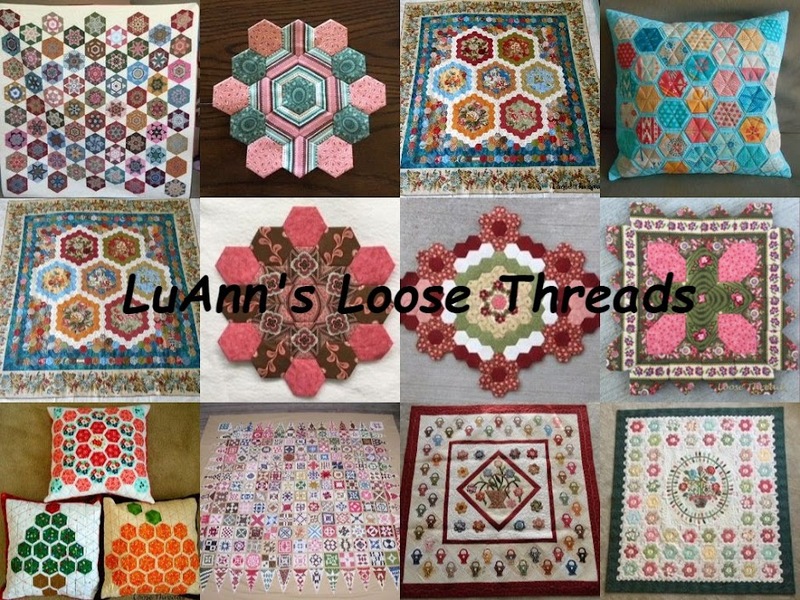 She has lots of quilts, quilt tops, and quilt blocks. I own several of the baskets you see here and quite a few jars of the Amish Apple Butter and different kinds of jams. This week has been really busy. I have photos of our Friday night show and tell, but I'm leaving bright and early tomorrow morning (6 am), for a weekend in Paducah to see the quilt show there so I'll post more when I get back. Here is my finished Talkin' Turkey quilt top from the Bonnie Hunter workshop that I attended in Cincinnati a couple of weeks ago. The pattern for this quilt can be found in Bonnie's book, String Fling. I made my quilt one row shorter and one row narrower than the original so it would fit on a full sized bed. I love this quilt, and it's one that I would make again in a different color. On Friday after the quilt show in Lebanon, Kentucky (that's been about 3 weeks ago), that I posted about here, we went to Fabric Shack. I have no proof that I was there because I didn't take one single photo. Oh wait.....there's the charge receipt for proof. I've ordered from them on line before, but this was my first time in their shop. Since there are no photos of the shop, I'll just show you some of the fabric that I came home with. This is from Moda. I may make some hexagons out of this. I really don't have a plan. I just bought it because it was pretty. More fabric without a plan, but I liked the red fabric. I'm sure there is a plan for that border print. The black and white came from Pohlar Fabrics booth at the quilt show. I thought the brights would look good with the black and white. And I guess I don't have a plan for these fabrics either. I do have a plan for these. The batik in the center will be my border. After we took Bonnie Hunter's Talkin' Turkey class on Saturday, we went to IKEA. I love that place, and the one in West Chester, OH, is the closest one to me. We shopped and ate chicken tenders in their cafe. I bought the IKEA cart. Mine is tan color. I have it by my recliner in the family room filled with sewing and knitting. I won these fabric scraps from Kelli over at Seriously I Think It Needs Stitches blog. The fabric is Blackbeard's Pirates from Riley Blake. I bought the piece on the left to use for border. I had a wonderful visit at Michele's home in northern Kentucky. Her home is filled with everything that I love: Longaberger baskets, collectibles and lots of quilts. Here are photos of just a few of Michele's quilts. She showed me a lot more than these, but I guess I was too busy looking and enjoying the show and tell and forgot to take photos. If you are a quilter, Michele's home is filled with inspiration. This is her Stars in the Garden quilt. The pattern calls for 1/4", 3/8" or 1/2" hexagons so it can be framed. Michele used 3/4" hexagons. By using 3/4" hexagons, this quilt made a nice sized wall hanging. This one is on my list of quilts to do, I love how the black border frames the quilt and just makes the colors pop. This quilt is Butterscotch Tart a pattern by Fig Tree and Co. I really like this pattern and plan to try it soon. While I like the Butterscotch Tart quilt above, this one was my favorite. I love that fabric in the setting triangles. This is Sunshine, Lollipops and Rainbows, a pattern by Sue Daley. I love the vibrant colors in this one. I don't know the name of this pattern, but it's made of quarter sections of Dresdens. This one might be an Edyta Sitar pattern called Shooting Star. I love all of the red in Michele's quilts. I have this Jo Morton border in this colorway and pink. I still haven't used mine, but I love what Michele did with hers. It makes a wonderful border with mitered corners. Here's another beautiful red quilt. Again, she has used beautiful border fabric. I haven't tried a lone star quilt yet. After seeing those that Michele did, I just might try one. I love how the color appears to swirl in this one. Here's another one. The placement of the red just makes this one pop. I think this batik Lone Star is my favorite. I love how the star colors are pulled from the border. I love this bow tie setting with the randomly placed snowflakes. I'm pretty sure this is some of Edyta's fabric (Laundry Basket Quilts). Here's a photo of the two quilts hanging on the wall in the room where I slept. Notice the bright, red quilt in the bottom corner of the photo. Here is that red quilt. The photo was taken on my porch. I liked that quilt so much that Michele gave it to me. When I was a teenager, my Grandmother made a quilt for me. Besides the one from my Grandmother this is the only quilt that I've ever received, and I am truly touched. I just love it. Thanks again Michele! I'm a bit behind on my posting. I still have another post or two from my trip, and I've been doing some sewing, too.